A recent study suggested that the incidence of diabetes in cats was as high as 7 in 1000. 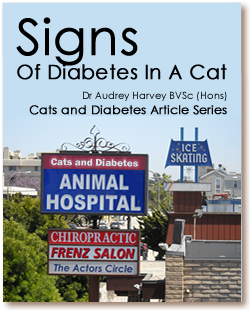 With over 86 million pet cats in the United States, veterinarians can expect to treat several diabetic cats each year. It’s important that cat owners are very familiar with the signs and symptoms of diabetes, so that their furry family member can start treatment as soon as possible. Diabetes develops when a cat’s pancreas doesn’t produce enough insulin. This means that the glucose from their food can’t get into the cells of the body to provide them with energy. One of the least savory parts of owning a cat is cleaning their litter tray. Diabetic cats urinate much more than normal, so you’ll have to do this more often. With high levels of glucose in the bloodstream, their kidneys will excrete the excess in the urine. This is accompanied by increased fluid loss through the kidneys, and more frequent visits to their litter tray. If your cat spends a lot of their time outside, you may not notice the increase in urination. Often, the first of the symptoms of cat diabetes you recognize is that they are drinking a lot more than usual. Even if you don’t see them drink from their water bowl, you’ll notice that you have to refill it more frequently. The reason for their excessive thirst is easy to see. Their body loses more water than normal as it flushes the extra blood glucose through the kidneys, so they have to drink to replace it. Another of the more common feline symptoms of diabetes is a voracious appetite. Because the cells in the body aren’t getting their glucose, they think they are starving. The cat feels the need to eat more and more to provide fuel for their cells. However, without insulin, it’s futile. In spite of their enthusiasm for food, diabetic cats lose weight. Because they can’t use glucose for energy, they start to break down their body fat stores. They become quite thin, and their muscles become wasted. The end-products of protein metabolism are ketones, and they too are excreted by the kidneys. If a cat’s diabetes isn’t treated, they can develop a serious condition known as diabetic ketoacidosis. This is a medical emergency, and can be fatal even with treatment. Cats with this condition are lethargic, vomiting and extremely depressed. They dehydrate quickly, and you can smell the ketones on their breath. They smell like acetone nail polish remover. If you see any of these diabetes signs and symptoms in your cat, take them to the emergency veterinarian straight away. One of the biggest risk factors for diabetes in cats is obesity. If you keep your cat’s waistline trim, you reduce the risk of them developing this disease. All cat owners must learn to recognize diabetes symptoms in cats because, with prompt diagnosis and the appropriate treatment, their four legged best friend can live a normal and happy life.